Brands that are part of growing up cut deep into the psyche. I saw an advertisement for one of those brands the other day while in Beijing and was compelled to dig deeper. The more I dug, the more I realised that this is a brand that is destined for great things in China. Take a bow Clarks shoes. I have memories of wearing Clarks back in the 60s and 70s; of having a shiny new pair at the start of every school year; and of not growing into them until the New Year (my Mum made sure that the new pair was always at least half a size too big, to allow "room for growth"). My Clarks were remarkably resilient. They were my football boots (I played every lunch time), my running shoes (in those days I used to run a lot), and they were also great for tree-climbing. They never wore out. They were always comfortable, always ready for action. What's more, they were never the target of any peer-group ridicule. Nor did they attract admiring glances. Not being one to show off, this is the way I liked it. In short, they fitted in more ways than one. After that trip down memory lane, it's time to hit the fast-forward button and jump 40 years or so to the present, to this week in Beijing. Clarks, I can report, has moved on. It still talks about quality and comfort I'm pleased to say (because that's in the DNA of the brand... which is not a bad strand of DNA for a shoe-maker to have). But it also dials-up something that I have always taken for granted – its Britishness. Those easily offended by stereotypes and clichés may recoil at the sight of a full English-breakfast of them on their China website that includes a bulldog, a cup of presumably Earl Grey tea, cakes, and (taking the biscuit...) red London buses. But somehow it all works, in a quirky sort of British way. This is in no small part due to the choice of stylish models and a powerful song. As the red-buses whirl by, you hear a London-theme tune, Caroline, London 1940 by Sleep Station, being played with gusto. Even President Obama is a fan of the group, so who am I to argue. This cool track, from the album After the War, manages to energise and contemporise the imagery of those red London buses, and even makes the "Tea" sign looks edgy. While watching and hearing this, the Chinese line on the screen simply declares (in a very understated British way of course) that "London fashion is at the cutting edge" (Yinglun shishang qianxi). Yinglun can also be read as "Britishness", and shishang as its attitude. The tone of the Clarks' China-website is a good fit with the vibe of Cool Britannia that the London Olympics and its amazing opening ceremony, and the London Paralympics have done so much to engender. Say goodbye to that stiff upper lip, standoffishness, reserve and, worst of all, snobbery. Britishness, these days, is about approachability, warmth, generosity of spirit, progressiveness, innovation (think, also, of the award-winning pavilion at the Shanghai World Expo); and of course it's also about self-deprecating humour (the bulldog's expression in the screen-grab below sums it up nicely). In short, it's about celebrating idiosyncrasy. But it's also very much about staying true to the things that really matter... Quality, style, doing the right thing in the right way, and obsessive standards of craftsmanship. Don't take my word for it, check out the British tourism board LOVEWALL at the Visit Britain website if you're in any doubt (and no, in case you are wondering, I am not being paid by the tourism board to write this, nor do I have any connection with Clarks shoes, other than an emotional one). 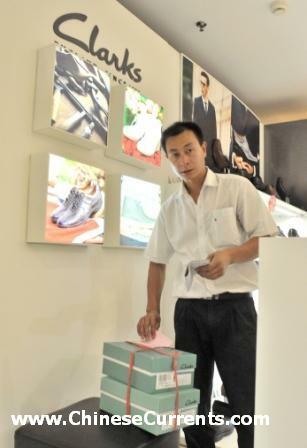 This week, with thoughts of buying a pair of shoes in mind, I set about planning my trip to a Clarks' shop in Beijing. I typed "Beijing" into the store-locator page on their website and was immediately shown a map of the capital, which had 32 shops marked on it. One of those shops, for reasons that escaped me, was highlighted. It was in Sogo – a very, very large shopping centre – a few miles west of Tiananmen Square. It's a long way from where I live, but Wednesday was another lovely sunny day in Beijing (strange, but true) and Sogo was somewhere I'd only read about. So two good reasons to go west. I arrived at lunchtime. Most shopping centres in the capital are struggling to attract people outside of the weekends, but you'd expect to see someone. In the hour that I spent on the third floor of the north building, I didn't see a single customer. There were hundreds of people, but they were all working there. The place is so big, it took me quite a while to find the Clarks shop. But where was the Clarks' sales assistant I wondered? Undeterred, I found a pair of shoes I liked. Noticing that I needed help, the assistants at the neighbouring shops leapt to the rescue. Instead of trying to persuade me to switch from Clarks to the competing-brands of their employers Ecco and Skap, they raced one another to contact the Clarks' employee on their mobile phones. She had, I was told, just popped up to the cafeteria on the 6th floor. Far from being offended by her absence, I was impressed by the speed she abandoned her lunch to attend to me (despite me telling her Ecco comrade to tell her there was no rush). I would later find out that the shop assistants at neighbouring outlets take a staggered lunch-break from Monday to Friday and alert one another if a customer turns up. If today's paucity of shoppers was anything to go by, I can't imagine that lunch-breaks are disturbed very often. I showed the assistant the style I had chosen. Unfortunately, the largest pair of that style in the store was three full-sizes too small for me. Ms Han said that she could get it sent here from another store in Beijing, but after checking the computer, she had to break the news that the largest size stocked in Beijing was two full-sizes too small. "Do you have anything that fits me?" I asked. Ms Han shook her head. The largest pair of any style in Beijing was one full-size too small. So much for me thinking that Clarks' Britishness would extend to shoe sizes. What impressed me, however, was Ms Han's determination to help. She even offered to try to get the style I wanted in my size, promising to alert me by email if successful. As well as being thwarted on my quest to buy shoes, I also failed to talk with anyone who was shopping for Clarks (or shopping for any shoe brand for that matter). So I turned to a friend in Shanghai for help. I thought that Ms Ying would be able to put me in touch with a Clarks' wearer, but had no idea that she wears them herself. 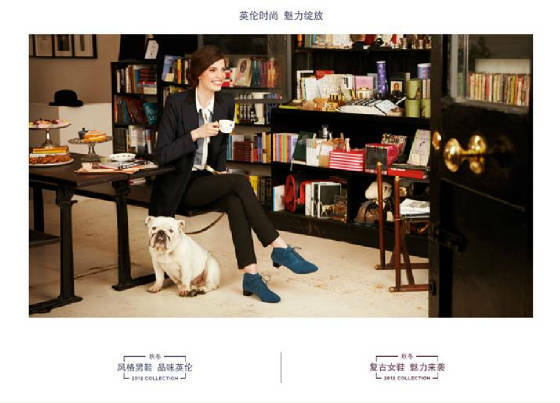 Ms Ying is not just a Clarks' customer, she is a fan. "Clarks? It's one of my favourite shoe brands in the world," she gushed. "They are extremely comfortable, as well as being durable... excellent English quality". I asked Ms Ying about her thoughts on stylishness. "Stylish? Yes, they are my kind of stylish... something I really enjoy wearing... something that's for me... not to show off to others." Ms Ying managed to capture the mood of the new generation of Chinese consumers, who are as concerned about what a brand does for their soul (if you'll excuse the footwear pun), as they are about what it does to make their day that bit better. For an ever-growing number of people here, it's no longer about the signal that the brand projects and the way it is perceived by others. Ms Ying is at the forefront of this movement; but has no interest in being seen to be so. "I just find them so comfortable," she repeated. Good for the soul indeed. This is an edited version of an article written in September 2012 .